On Monday we had our 4×4 meeting (a monthly meeting) and discussed our book-club book from last month. 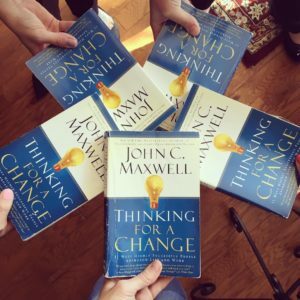 The book we read was, Thinking for a Change by John C. Maxwell. It was a great book and was enjoyed by all. The main focus of the book was to help us expand our way of thinking in a positive way and to use creative thinking to make a unique difference in our jobs and in life! Our team all shared ideas on implementing the best care for our patients and we have many new ideas coming your way! Book club at Sugar Fix! We had a BLAST with social media this week as well! Dr. Emery is learning all about SnapChat (she’s creating a daily “story” that you don’t want to miss because they “disappear” after 24 hours!). We also uploaded our library of educational and fun videos onto our Pinterest page. Dr. Emery has created videos where she’s broken down some of the most common patient dental questions and put them into short, explanatory videos. Here’s a link to that page: https://www.pinterest.com/sugarfixdental/ If you watch a video (or two or three or more!) and you like them, we’d be so appreciative if you’d take a moment to “LIKE” them or share them with your friends or family that might benefit from them as well! The smile below was created by Dr. Emery! 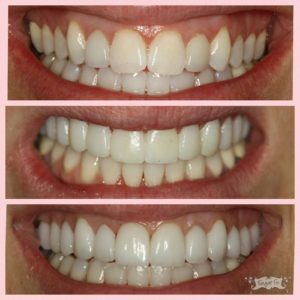 The series show the original smile of the patient, the temporaries in the middle picture, and the last picture is the beautiful smile with porcelain veneers. The patient is so happy with her new smile that eliminated the crowding of her teeth and gave her a perfect symmetrical and broadened smile. Her next step is to do Invisalign to correct her lower arch. 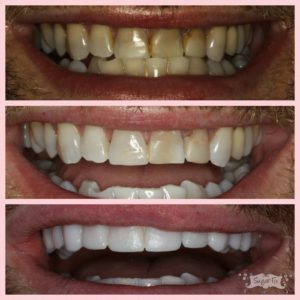 That is it for this week, stay tuned for next week’s case of a veneer delivery and ZOOM whitenings!